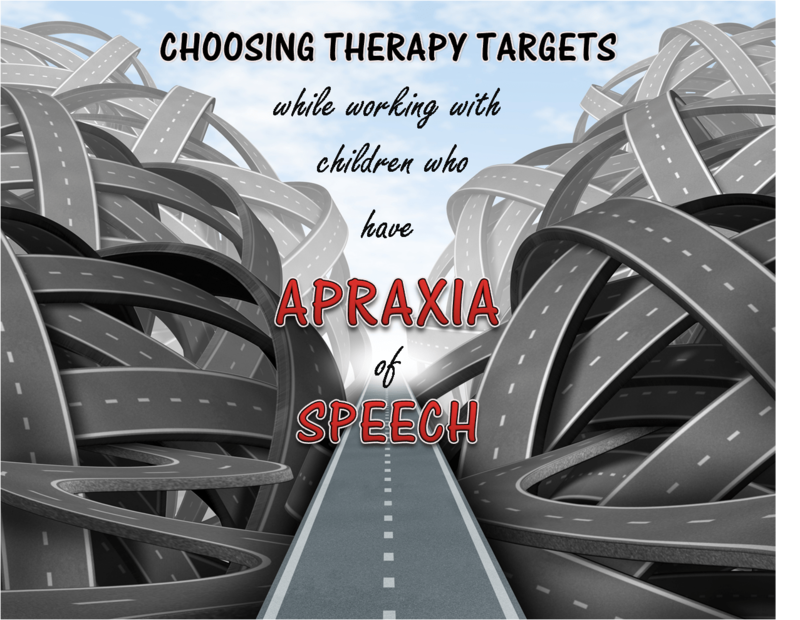 I have a very simple and concise form to help determine therapy targets when working with children who have Apraxia of speech. This form is incredibly useful to me. It helps me track my clients’ progress as well as guides me through choosing therapy targets during each session. If you have read some of my other posts about Apraxia you will know that I like to focus therapy on specific movement patterns (two pure speech sounds with the movement in-between). It is my theory that once a child can produce all possible movement patterns – they will be an intelligible communicator!!! This form is simply a combination of ALL of the possible movement patterns in the English language. So based on my theory – once a child can produce every target on this sheet – they will be an intelligible communicator. This form allows you to easily view where each child is (in terms of their progress) and how much further they have to go. It gives you a starting and ending point – which is helpful to keep you from feeling overwhelmed and motivated to push forward. This form will take you through the entire scope of therapy targets for children who have Apraxia in a few simple steps. 1. Informally assess the child’s ability to form each pure speech sound in isolation by producing each sound listed across the top of the document. Model each sound for the child and circle the sound if the child is able to imitate the sound correctly. 2. Informally assess the child’s ability to produce Vowel-Vowel movement patterns by completing the yellow portion of the form. Model each movement pattern highlighted in yellow and circle the movement pattern if the child is able to imitate it correctly. 3. Repeat step #2 for each section in the form: Consonant-Vowel (green), Vowel-Consonant (blue), Consonant-Consonant (purple). Make sure to circle each movement pattern the child is able to imitate correctly. Once you have informally assessed the child’s overall abilities you will have a good idea of where to start in therapy. 1. At the beginning of each session have the child quickly drill through each pure speech sound and movement pattern they were previously successful with (i.e. drill through each circled target at the beginning of each session). 2. Target a combination of known movement patterns next. For example: if your client can produce /ui/ and /it/ – try targeting them together to make /uit/ (or “wheat”). Or another example would be – if your client can produce /mɔ/ and /mi/ – try targeting them together to make /mɔmi/ (or “mommy”). 3. Target a new pure speech sound. This is the tricky part – getting the child to produce a sound they have not been able to produce before. Use other similar sounds (sounds in similar groupings- manner, place, voicing, etc,) that the child can produce to help mold/shape/form them into the new pure speech sound you are teaching. 4. Target new movement patterns. If you know the child can produce two pure sounds in isolation – but hasn’t been able to produce them together in a movement pattern – that is where you should start. This part of therapy just consists of slowing down the movement from one speech sound to another (see my other Apraxia posts for more help on how to do this) and allowing the child to practice and memorize the movement between the two sounds. The overall goal of this form is simple. You can easily keep track of what the child can do and what they have not been able to do yet. Start each session reviewing those targets they have been able to do in the past – and follow a slow progression of introducing new targets. Work on combining known targets together to make more complex targets. Good luck, and like always let me know if you have any questions. Alissa, this chart is great. Thank you so much! My soon to be 3 year old grandson is in our First Steps program , having been diagnosed with apraxia. I am also employed by our school district as a speech implementer and although I do not work with the preschool/primary age kiddos, I enjoy finding and using therapy ideas that might help him advance. Thanks again for your valuable information. Wow this is so helpful – as an SLP I essentially do this but try to go off the top of my head… This makes the process much more organized and is a great way to show concrete progress! Thank you so much for sharing!! I have never seen a chart like this and as a new SLP it is priceless!!! You’re amazing! Thank you for sharing! I wish I understood more of the chart 🙁 I”m an early childhood teacher now homeschooling my own kids and have a soon to be 3 year old also that has CAS… our speech through ECI hasn’t been great especially with apraxia I”m trying to learn as much as I can an incorporate as much as I can into our regular day as well as have a short learning session of concepts and speech also…. which is proving hard on the speech part. I’m not sure what kinda things to target and I saw your post on pinterest and got super excited from the title bc the direction of it seemed perfect! I do have some knowledge of phonics from teaching kindergarten with some fantastic speech therapist but I feel lost on actually implementing it with my own…. do you have any good book recommendations or have a suggestion as to where to go for a break down from a mom point of view…. Sorry – no books I can think of to recommend. My main advice is to practice sounds in isolation (sounds all by themselves), and once your child can produce two sounds – try practice connecting them together. Keep doing this on a daily basis and encourage any sound or sound combination when your child is attempting to communicate. Good luck. Let me know if you have more questions. Alissa, I was wondering what treatment materials you use for working with elementary aged children who are speaking in full, complex sentences, but who have imprecise intelligibility in connected speech? My 6 year-old client with ADHD and apraxia can produce all English target sound combinations at the single word level (one and two syllable level reliably; three syllable level inconsistently). He also has articulation errors for /l/ and both TH sounds. Thanks for sharing any resources or ideas. Great questions. I would recommend using carrier phrases, (I want …, I need …, I see…, You are…, He is…, etc.) That way the child can be practicing longer phrases/sentences, but the repetitive nature makes it easier practice than just random sentences. Repetitive books (Dr. Seuss is always a good way to start) are awesome for treating Apraxia. They give the child opportunity after opportunity to hear and practice specific phrases and sentences. The repetition makes it less overwhelming practice for the child. Once the child gets really good at practice with carrier phrases you can start mixing it up more and making the practice less predictable. I hope that gives you a few ideas. Good luck.